Maul is the mad scientist we didn’t know we needed. Since debuting his Jetsons-like cocktails in late 2014, the former Clio maestro has introduced the drinking electorate to techniques like flash infusion, rotary evaporation, and of course, flavor-infused vapor. This year, it was all about paint garnishes, 40-degrees-below-freezing ice cubes, and charred fruit smokes -- and it’s only going to get more interesting from there. What currently excites you most about the Boston cocktail scene? 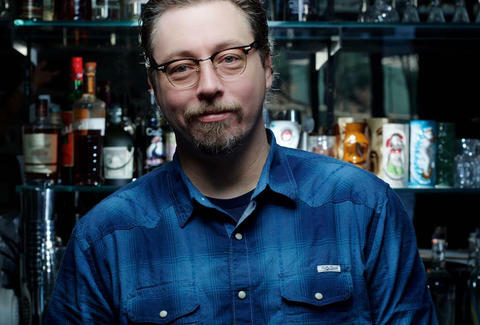 Todd Maul: I love watching the city’s very talented, up-and-coming group of bartenders find success. At Café ArtScience, Koharu (Koko) Usui is a great example of someone who has figured out what Boston’s bar scene is all about and created her own unique spin on it. What's been your vision for the Cafe ArtScience bar program in 2016? Maul: My vision for the bar program this year, and really since we opened, has been to try and perfect what we’re doing currently and to tweak everything we do to make ourselves better. At the very beginning of this year, we started using sub-40-degree ice with hotel ice, and measured the temperatures to find that the combination makes a colder drink and stays colder longer. That’s the way I like my team to think: to never fall into a routine and to always try to make a better drink. What's your favorite drink on the menu right now? Maul: To be honest, my favorite drink isn’t on the menu yet. It’s called the Frère Greg and it’s a good example of what we’re doing right now. About a year ago, we started using our rotational evaporator to experiment with fractional distillation on Chartreuse. Instead of just boiling it off like we normally would, we left Chartreuse in the rotovap and used the middle stage that we weren’t using before. The result is what we’re calling Chartreuse water. It’s light and aromatic with some funky Chartreuse notes. We didn’t think it was meaty enough for anything at the time, so we put it in a glass container and put it in the fridge. Last month we brought it back up in conversation and said, "Wouldn’t it be cool to rinse a glass with this to get that Chartreuse note from below?" That became the Frère Greg. We rinse a glass with Chartreuse water and then pop it into the blast freezer for a couple minutes while creating the rest of the drink -- gin, sherry, and vermouth. Once it’s frozen solid, we add the liquid components. When the drink begins to warm up in a guest’s hand, the aromatics of the Chartreuse water really open up. How does your background in furniture making influence your cocktail making? Maul: I think the trades can be compared in two ways. The first is the meticulous nature of furniture making, which is essential in bartending when it comes to proportions. The other part is the constant effort to modernize a trade: a good example in furniture is a dovetail, which is a very time-consuming thing to make, because it has to fit perfectly. But in the end, a dovetail is the only joint that is stronger than the materials it is made from. I try to think about that in my work every day -- how can I take what I have and make something better with it? What dream piece of equipment would you love to have behind the bar? Maul: I’m lucky to say that I just purchased some equipment that I’ve had my sights on for a long time. It’s a Thermo Fisher Blast Freezer that can freeze liquids to negative 120 degrees. For our purposes, we’re going to shoot for negative 80 and use the blast freezer to rethink our frozen blender drinks. Being surrounded by innovators in Kendall Square, we’re hoping to collaborate with some pharmaceutical companies nearby to see what we can do with it. But the first step will be finding space for it behind our bar! What will you be drinking on December 31st? Maul: After work, I’ll probably reach for a PBR or a 'Gansett. What are you most looking forward to in 2017 in the Boston bar scene? Maul: I think 2016 proved that we have some incredibly talented cocktail, wine, and beer professionals in Boston. I’d love to see some of our city’s restaurants make it further on the James Beard Foundation Award’s Best Bar Program list next year. Meaghan Agnew's home bartending game is weak, which is why her bar-hopping game is so strong. Track her drinking tra(va)ils on Twitter and Instagram at @meaghandeth.